Avani Industries Monofilament Hair Wigs supplier in Delhi, India. 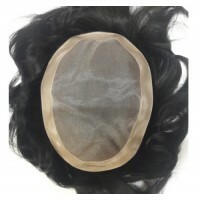 Avani Industries Fine Monofilament Men's Toupee/ Gents Wig 9"x7"
Type: hair patch to cover the bald area can be attached using clips, tapes, and glue. It has a breathable base. This hair system is single knotting system. Fine Monofilament Hair system is quite strong and durable. Specifications of Avani Fine Monofilament Men's Toupee/ Gents Wig 9"x7"
Product Code: Fine Mono "9x7"